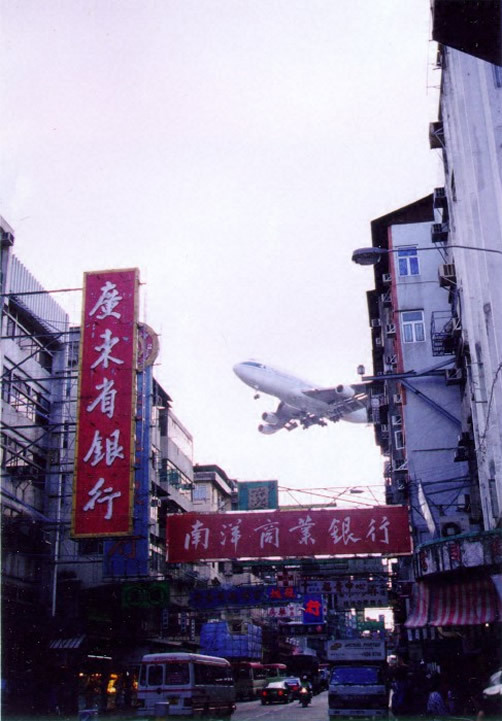 (P1) Kai Tak Airport, in the middle of Hong Kong, was once considered to be the world’s most dangerous place to land. The international airport served as a major Asian transportation hub between 1925 and 1998 when it was closed down. A new airport, Chek Lap Kok, was built on an island in Hong Kong harbor. (P2) Landing at Kai Tak International Airport was not only a frightening and thrilling event for passengers but also a demanding and difficult task for pilots. It required a lot of training and maneuvering around many skyscrapers and the 700-meter high mountains that surround Hong Kong. (P3) Pilots had to land manually, so visibility was more important than anywhere else. An orange and white checkerboard in the mountains told pilots where to turn in order to make the final landing approach. (P4) When it closed down Kai Tak only had one runway, which extended into the sea. It was difficult to land during extreme weather conditions, especially when typhoon winds hit Britain’s former colony. Pilots sometimes aborted the first landing approach, swung the plane up and came around for another attempt. (P5) In the course of time, Kai Tak outgrew its capacity. In 1996 over 30 million passengers landed every year, even though the airport was only designed to handle 24 million. The airport in the middle of Hong Kong made it difficult for city planners to build new skyscrapers because they would interfere with landing approaches. (P6) For passengers who had window seats, landing at Kai Tak was an extraordinary experience. Planes flew so slow that you could actually see into people’s living rooms. Today, Kai Tak Airport is a cruise terminal, which can accommodate large passenger vessels and could make Hong Kong into a hub for Asian cruises. Explain how you would feel landing at this airport. What do you think goes through the mind of the pilots when landing? What’s the name of the current airport in Hong Kong? Is the Kai Tak airport still open? How did pilots have to control the plane when landing?